Good morning ... This is my kind of content: Look at all these businesses that are very obviously located in former Pizza Huts. Pharmaceutical companies' stocks soared Friday when President Trump released his plan to curb prescription drug costs — and that's a pretty accurate assessment of how big a threat this proposal is. It would mostly move costs around: There are few new steps in here to try to lower the sticker price of prescription drugs. It does call for increased competition from generics — a push that's already well underway at the Food and Drug Administration — but focuses most of its attention on middlemen. Some of those goals are contradictory. 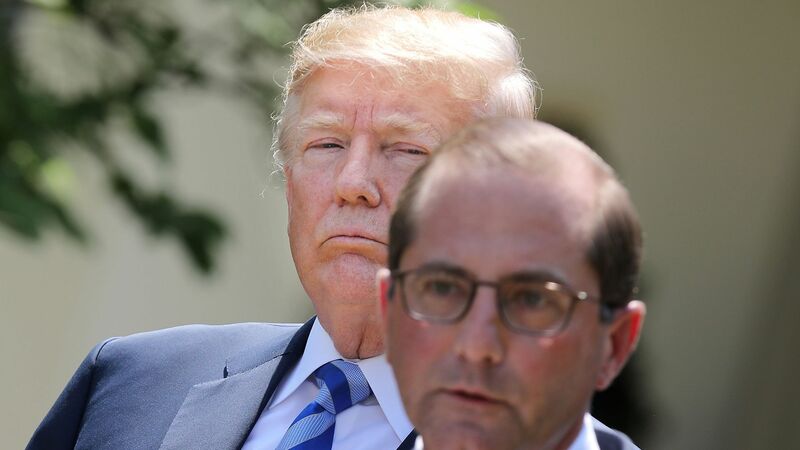 "We are calling into question, today, the entire structure of using rebates as the method of negotiating discounts," HHS Secretary Alex Azar said during Friday's White House press briefing. But in the meantime, the proposal would give pharmacy benefit managers — the companies that negotiate those rebates — a bigger role in Medicare. Real change is a long way away. The plan includes few immediate actions, and more calls to either study an issue or for Congress to act — both of which give industry more room to flex its lobbying muscle. Some ideas may not work: Experts have already questioned whether parts of the plan are feasible — not just politically, but substantively. Trump, for example, wants foreign single-payer systems to start paying more for drugs, saying their low prices mean that U.S. payers end up footing the bill for all the world's research and development. "I don’t think the fact that I pay higher prices than students at movie theaters lowers their price, so I’m not particularly bullish on this idea either. Prices reflect willingness to pay, and with pharmaceuticals, the United States is willing to pay a lot. We’ll pay less when we decide to pay less," American Enterprise Institute's Ben Ippolito told Axios' Caitlin Owens. One seemingly minor proposal from Trump's proposal helps explain how many steps are involved here, and how that complexity can lead to stasis. The proposal: "Call on the FDA to evaluate the inclusion of list prices in direct-to-consumer advertising." Breaking it down: Drugs' list prices absolutely matter, especially to the uninsured and people with high deductibles, who often have to pay at least some part of the list price before their coverage kicks in. But most patients don't pay the list price. Their prices have been discounted by some combination of wholesalers, PBMs, insurers, employers and Medicaid rebates. And then the consumers themselves only pay some portion of that discounted price. So, disclosing the list price — the highest relevant number — would give many consumers an artificially inflated understanding of how much they would have to pay. And, because there's so much variance in the prices for each payer, it's hard to find another metric that would give consumers a better idea of what they're in for. The big question: I asked Nick Bagley and Jonathan Adler — two law professors who are often on opposite sides of health care legal issues — whether there could be any First Amendment problems with requiring drug makers to disclose their list prices. Both said the government would be on solid ground. Yes, but: With so many technical and policy questions, you can see how even this relatively simple proposal could end up not making it across the finish line. Congressional districts that tend to vote Democratic generally have more people who are living in poverty and don't have health insurance, compared with districts that tend to vote Republican, Caitlin reports. That holds true irrespective of whether a state has expanded Medicaid. Between the lines: There's an obvious connection between poverty levels and the number of uninsured: Health insurance is expensive. The fact that blue districts have higher shares of each might help explain why Democrats tend to focus more than Republicans on health care and government assistance to the poor — and why these topics will resonate with more liberal voters in the midterms. Check the interactive graphic here. Earnings season is on — not just for for-profits but reports are trickling in for several of the largest not-for-profit hospital systems as well, Bob Herman reports. The bottom line: Several hospitals, especially those with a lot of brand and/or market power, have stayed quite profitable in the face of stagnating or fewer admissions. Case in point: Houston Methodist’s admissions in Q1 actually soared 7%, and the network more than doubled its operating profit to $61 million on more than a $1 billion of revenue. What to watch: Catholic Health Initiatives, as the system is still hemorrhaging money ($35 million operating loss in Q1). But, it's making headway on selling its health insurance company, QualChoice, that has gone bust. CHI has a buyer for the Medicare Advantage operations and “prospective buyers” for its commercial plans, according to bondholder documents. CHI also maintains its merger with Dignity Health will happen later this year. The system that's supposed to be combining health records between the Pentagon and the Veterans Affairs system has "devastating" shortcomings, Politico reports. Are cancer drugs moving faster than the science can support? Some recent clinical trial failures suggest they might be, according to Science. "60 Minutes" looks at complaints about surgical meshes and the flood of lawsuits against their manufacturers. The Atlantic posits that efforts to build a more efficient health care system are actually contributing to physicians' burnout. What we're watching this week: Senate health committee hearing Tuesday on the 340B drug discount program. What else is on your radar? Let me know: baker@axios.com.